This entry was posted in conspiracy, Culture War, Evil, Hillary Clinton, LGBT, Liberals/Democrats/Left, occult, Radical feminists, Satanism, spiritual warfare, Supreme Court, United States, Wicca and tagged Catland, Dakota Bracciale, definition of hex, feminism and satanism, Justice Brett Kavanaugh, percentage of U.S. wiccans, Satanists at Trump inauguration. Bookmark the permalink. The laws of the universe and GOD THE ALMIGHTY, don’t allow witchcraft to penetrate our souls, and because we are nonbelievers its effect is null and reverts to those that practice it with consequences. 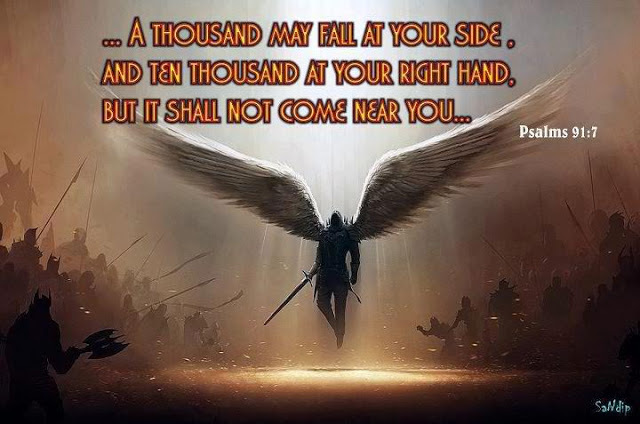 Jehovah of Armies will crush their backs! So, the democratic nature of witches is finally out of the closet. Let us hope that they do not suffer too badly when the consequences of their Hix falls on the party as a whole in the mid-term elections. Isn’t it great when “The Enemy” shows themselves? Christians have nothing to fear from these characters. Evil is indeed afoot upon the Earth. They are evil and prideful. There should be no quarter for these. There should be no “acceptance” or “excuses”. They are what they claim to be. Therefore they should live as outcasts, if they live at all. Simply say; “get away from me Satan”. 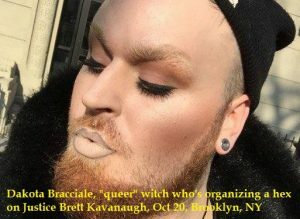 This ‘bracciale ain’t got much in the way of any real powers to do any thing, being that he is queer, disabled, and having to work for a living. Appears to me he is living under some hexes and curses him self. May be it would help if he started calling him self a “warlock” instead,….so as not to confound the demons. The left is getting desperate. Reverting to their roots, I guess. Sure hope the Democrats adopt these nuts into their mainstream “base” and continue to promote/crow about them. 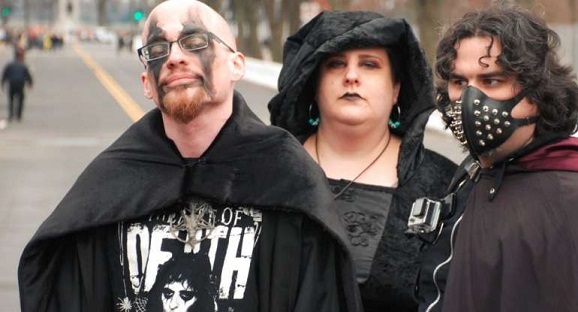 Also pretty sure the Dems won’t “test” these self-proclaimed “witches,” before welcoming them to the fold, by binding/dunking them underwater to see if they survive…..like the Puritans did in order to test their “true powers.” Wonder why not? I was driving past our marina last night about dusk and there were a whole gaggle of these types walking in a sort of procession up the hill. I’ve never seen that before. They were dressed like those in the article picture. All in black. I thought about a Halloween party but its too early and they weren’t laughing and smiling. 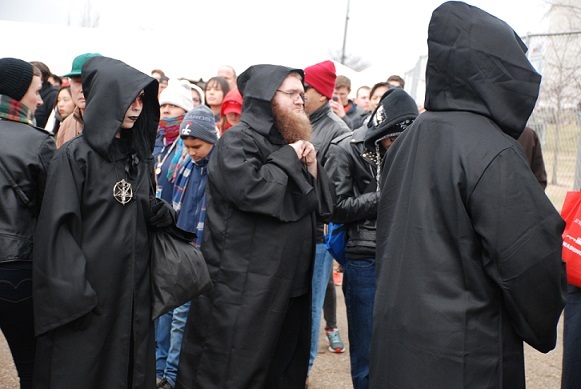 According to Breitbart, around 60 freaks showed up for the hex. I’m not worried as we know much more are praying against this evil.